This is a splotchy image of a perfect flower. 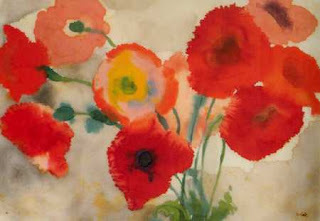 Nolde depicted the raw beauty of red poppies in a way that had been previously untouched. Before his expressive interpretation of the poppy, this image would have been rendered with more classical techniques. Paintings were expected to be accurate and not necessarily artistic before his time, however Nolde did not see art in this way and was hence one of the first Expressionists. If anything, the imperfection of the piece makes it relatable to a broader span of viewers. Just as our lives our sometimes messy, smeared or flawed, there is always someone that will see beauty in that whether it be a significant other, a friend or a god. The shades of pinks and reds clash as they merge together in the composition and the green from the vines have smeared into the center of some of the flowers which is completely sloppy usually avoided at all costs. Artistically, this watercolor is everything we try to steer clear of. It’s a prime example of our lives. We grow from the vines and smear paths with other friends, lovers and family, which all leave stains, but somehow we continue to grow and sway towards different paths to repeat the process again and again. We try to avoid it but the just as watercolors bleed irrepressibly, so do our lives. Although it sounds tragic, it’s clear to see in the watercolor, Red Poppies, that this vicious life cycle of hurt, pain, memories and growth is absolutely beautiful and often essential.